“Do you believe in miracles? Yes” Al Michaels makes the greatest call in sports broadcasting history as the American hockey team beats the Soviet Union in the 1980 Winter Olympics. Classic call by Howie Rose on Stephen Matteau’s goal in the second overtime to help the Rangers beat the Devils in Game 7 and advance to the Stanley Cup finals. Gotta love the reference to Mount Vancouver. “The Giants win the pennant. The Giants win the pennant. The Giants win the pennant. The Giants win the pennant.” New York announcer Russ Hodges goes crazy describing the “Shot Heard ‘Round the World.” Bobby Thomson’s dramatic, three-run ninth inning home run gave the Giants the National League pennant and broke the hearts of the Brooklyn Dodgers. Al Michaels is still broadcasting today, yet his most unforgettable call occurred 34 years ago in the tiny town of Lake Placid, New York. There a bunch of young American hockey players upset the Soviet Union in what ranks as one of the biggest upsets in sports history. “Do you believe in miracles?” says Michaels as the crowd counts down the final seconds. “Yes! 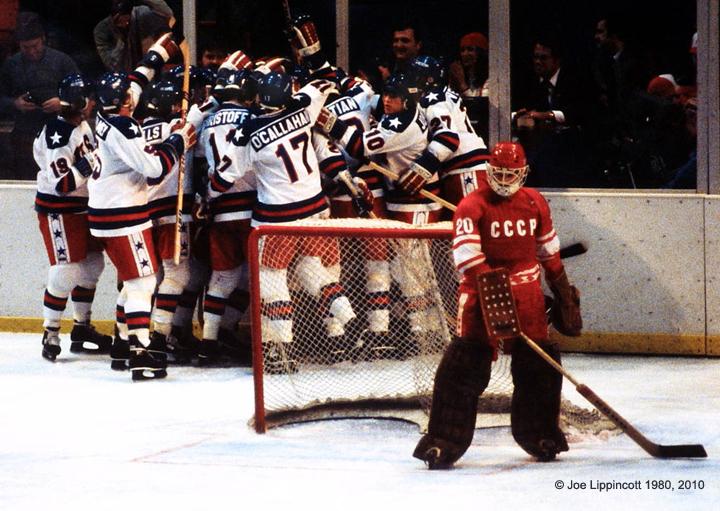 !” The exuberance of the Team USA players and the stunned looks on the faces of the Soviets tells it all. Ever since I first stumbled into a sports book, at Caesar’s Palace in Last Vegas more than 20 years ago, I’ve wanted to have a “book” right in my playroom. Imagine a room with dozens upon dozens of huge, high-definition screens, bringing you live action from ballparks, race tracks, arenas and stadiums around the country. A place with cheap $1.50 drafts, bar food and gambling, where you can bet on everything from the fifth race at Churchill Downs to who will win Super Bowl XXIV. Years ago, on a business trip to Vegas, a bunch of work colleagues were hanging around the sports book at Bally’s. Most of us were losing small sums of money on football games. But one guy knew the ponies and wasn’t afraid to put down large wagers. One time he came back from the betting cages waving $800 in the air, another time $1400. And the third time back, he returned with yet another large wad….and an IRS form. That same guy now owns several thoroughbreds and is a fixture at race tracks around the country. There’s nothing quite like a Sunday in Vegas during the NFL season. The sports books are packed, and crowds are watching each and every game with a strong rooting interest. A seemingly inconsequential play in a game between two losing teams may draw a huge ovation. A single play, a touchdown or a turnover, swings millions of dollars. One betting scheme I’ve always liked in the sports books is the long-term football odds. For example, the Giants are currently the NFC favorites, and are listed as 11-1 to win the Super Bowl, behind the Patriots at 11-2 and the Steelers at 9-1.The G-Men are favored to beat the Redskins by five points in their NFL opener at home on September 13. In college football, Florida is 9-5, Oklahoma 11-2 and USC 15-2 to win the national championship. On the other end, Kansas State, Louisville and Kentucky are all 200-1. At the end of the day, betting sports is a lot like life. There are winners….and there are losers. A friend of mine who loves to play the ponies sent me an e-mail recently, linking Big Brown’s stunning loss in the Belmont Stakes to an ancient proverb. Perhaps it would be wise to add the following line: For the want of a Triple Crown, a race was lost. It all points to a simple fact — you really do have to sweat the small stuff. Just ask Big Brown’s co-owner Michael Iavarone or trainer Rick Dutrow. Will Big Brown Break The Triple Crown Jinx? 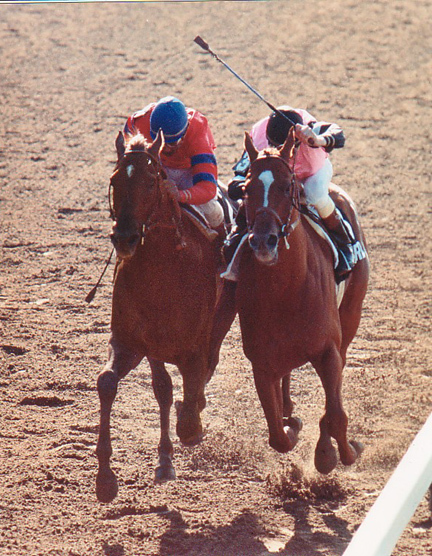 Affirmed, on the inside, edges out Alydar in the 1978 Belmont to win the Triple Crown. In the past 30 years, no less than 10 horses have come into the Belmont Stakes with a chance to win horse racing’s Triple Crown. All 10 have lost. Will Big Brown, the Kentucky Derby and Preakness winner and Belmont favorite, break the jinx? On June 10, 1978, Affirmed nosed out Alydar to win the Belmont and the Triple Crown in what many racing pundits consider the greatest horse race ever. It was the third Triple Crown in five years, following the great Secretariat in 1973 and Seattle Slew in 1977. There hasn’t been one since. “Been around racing 50 years,” Hall of Fame trainer Woody Stephens told William Leggett of Sports Illustrated after the 1978 Belmont, “and I’ve seen dawn come up over a lot of tracks. People will tell you about the great races between Citation and Noor out in California in the early 1950s, and the race between Ridan and Jaipur in the Travers at Saratoga in 1962. Great races. But Affirmed and Alydar in the Belmont? Probably the best horse race that’s ever been run. Going into the Belmont, Affirmed had beaten Alydar by 1/12 lengths to win the Kentucky Derby, and by a nose to win the Preakness. Seemingly, the two were as evenly matched as two horses could be. With Cauthen whipping Affirmed with his left hand, while Velasquez whipped Alydar with his right, the two were dead even with a 1/16th of a mile to go. Affirmed poked his nose ahead in front five strides from the finish, and kept inching ahead. He won by a neck. It was Affirmed’s seventh victory in nine meetings with his arch-rival, seven wins by a total of 10 lengths. Alydar remains the only horse to finish second in all three Triple Crown races. ‘It was a real horse race, all right,” Cathuen said later. Affirmed was the 11th Triple Crown winner and, for the first time, there were successive winners (Seattle Slew won in 1977). As the 3-5 favorite, Affirmed paid $3.20 to win. With only five horses in the field, there was no show betting. I was lucky enough to be at Belmont Park in 1978 with a bunch of friends to see horse racing history. 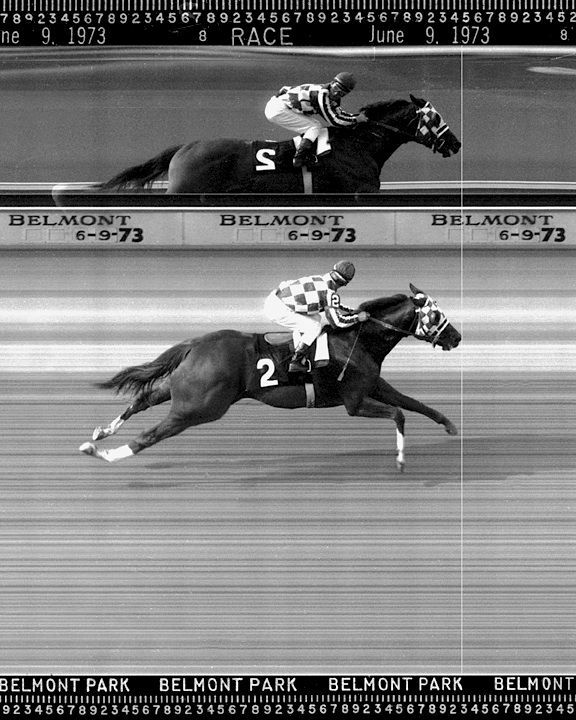 We had a great view of the finish and I will never forget that guttural roar of a New York crowd, building to a crescendo, as Affirmed and Alydar came down the stretch. We pooled what little money we had back then on Affirmed, but the real thrill was the race, not the payoff….atlhough the winnings helped us get over the Whitestone Bridge. None of us there that day ever thought that 30 years later we’d still be waiting for the next Triple Crown.